While I was posting the rest of Nikunja-rahasya-stava, a concert was going on in the meditation hall in honor of Swami Ma Chetan Jyoti. 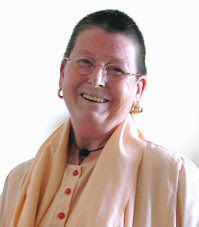 She passed away last Sunday in her ashram here in Rishikesh. She had been suffering from cancer for some time. I believe I may have mentioned her name before. She was a great kirtan afficionado and had dedicated her latter life to serving Indian classical music. In particular, she was a lover of dhrupada music and regularly attended the annual Dhrupada festival at Jai Singh Ghera. Her ashram is called Sri Krishna Kripa Ashram and its outside wall is decorated with a huge picture of Krishna and Arjuna. I told Shrivatsa Goswami about her passing on and he wrote me: "Grateful for informing about the passage Ma CJ. Hope it was peaceful and she is the service of the Divine Couple. I do remember her from Dhrupada melas. My prayers are with her." Well, kirtan is Radha Krishna. The concert tonight was full of Mira Bhai--ankhiyan shyam milan ke pyaasi. You cannot get away from it, because the truth is, that without Radha and Shyamasundar, there just is no madhura rasa. And madhura rasa is the taste for which we have been hankering since time immemorial. On Christmas, Ma Chetana Jyoti did some kirtan here, chanting Hare Krishna despite being already very ill. So I certainly thank her for having brought, more than once, a ray of Radha Krishna into this ashram. So I echo Shrivatsa's words and I chanted the Nikunja-rahasya-stava during the intermission in her honor.